Social-networking games gave a new face to the gaming industry with the advent of developers such as Zynga on Facebook. Here onward, there has been no turning back. And now it is Stardom: The A-List that has come to invade our smartphones and with the number of titles already lurking around, will this game be able to hold ground? 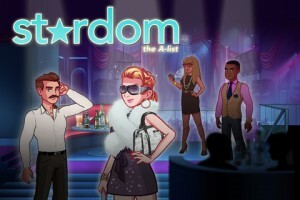 Created by Glu Mobile, a developer that has proved its mettle on both Android and iOS platform and still manages to surprise us with every new release, Stardom takes us on a quest to become a real celebrity! Yes, the whole deal of Stardom is to become an A-List celebrity. And while that might just be an impossible task for some in reality, Glu makes it all the more reachable in the virtual world. Players start out in a shambling hovel, and after a little encouragement from a friend, land a part time job at the local coffee shop. It is during this whole sequence that the core game play of Stardom is revealed in details. The in-app purchases are plenty, but at no point of time did it feel forceful or the developer is trying to shove-it-down the users throat. Presentation of the game is quite great, as all of its characters and environment are of good quality. You get your own avatar, choose your own look and style, and start your race to the top. Overall, players who are into the whole social-networking gaming or addicted to the SIMS gaming simulation will love the idea of Stardom, which just might make you hooked to your screen for a long time to come. The levels are vast, gameplay is rich, visuals are appealing and everything in the game makes it look just right.